Many people who suffer from intermittent or infrequent acid reflux attempt to manage their symptoms without the intervention of medical professionals. For short-term reflux caused by food or acute illness, these home remedies are a great option. However, if you suffer from frequent or painful acid reflux that interferes with your day, you should consult a reflux specialist like those at the Southern Reflux Center. Follow along today as we discuss some home remedy options for treating the symptoms of acid reflux. And, if these don’t work or you find yourself using them more than once or twice a week, schedule a consultation with one of our skilled physicians. To help prevent or treat acid reflux, there are a few things in your cupboards that you can consume. Most people are well aware of the healing powers of ginger, especially for GI distress. Ginger Ale is a popular option for settling an upset stomach and quelling nausea and abdominal discomfort related to vomiting, diarrhea, and other illness. Ginger tea is gentle on your stomach and can be used to prevent or treat acid reflux and even motion sickness! Don’t like tea or soda? You can consume ginger in any form to benefit from its power. Baking soda helps to neutralize acids. When you are experiencing symptoms of acid reflux or indigestion related to acidic burning, swallow a spoonful of baking soda to help stop the burning sensation. Bananas are a natural antacid. You can eat a banana to prevent or treat acid reflux. Of course, if you are experiencing acid reflux after eating a full meal, eating a banana may cause an overstuffing of your stomach, only increasing your symptoms, so try one of the other solutions. Bananas are a great treatment option on an empty stomach. Additionally, you can try apples, aloe juice, plain rice, chamomile tea, or a teaspoon of mustard. 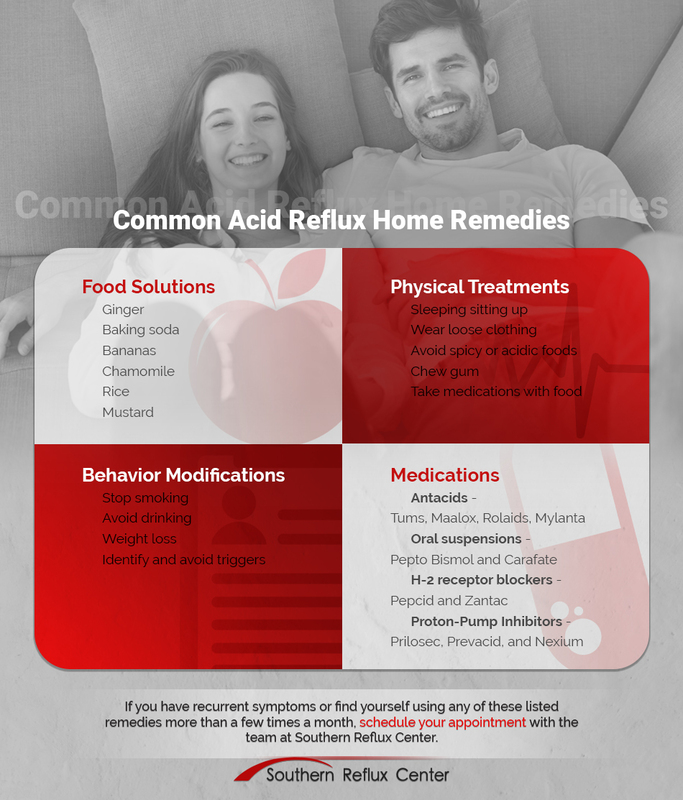 Once you have symptoms of acid reflux, if your other home remedies are not working quick enough or not at all, try one or all of these tactics. Sitting or standing helps you feel more comfortable when you are experiencing acid reflux because gravity can help keep stomach acid as close to the stomach as possible. In cases of persistent symptoms, you can sleep in an elevated position, either propped up with pillows or sitting up. Tight or ill-fitting clothing can cause your digestive tract to be compressed, which can cause or aggravate your acid reflux. To help reduce symptoms, wear properly fitting clothing or loosen your clothing, especially with meals. Spicy or acidic foods can cause burning in your digestive tract or stomach, the same way it does in your mouth when you eat it! Acidic foods increase acid levels in your stomach that only perpetuate the problem. Spicy or acidic foods can actually cause symptoms, even in the absence of acid reflux, so be mindful of how much of these foods you consume. Other things you can try include chewing gum, staying hydrated, and not taking medications on an empty stomach. If you experience symptoms of acid reflux more than once a week or due to causes that cannot be attributed to what you ate, try these lifestyle changes. Smoking causes the sphincter that separates your stomach from your esophagus to relax. This relaxation allows stomach acid to escape your stomach and backflow into your esophagus, causing discomfort and pain. Alcohol contributes to acid reflux in a variety of ways. Primarily, it causes your stomach to increase acid production. Drinking in moderation, with meals, this may not cause a huge problem. However, heavy drinking, binge drinking, or drinking on an empty stomach can cause severe irritation, especially when coupled with alcohol-induced vomiting. Additionally, alcohol weakens the sphincter between the esophagus and the stomach, allowing this excess stomach acid to back up into the esophagus. Increased weight puts a lot of pressure on all of your internal organs, including your stomach. This can cause food to prevent the sphincter between your stomach and esophagus from completely closing. Chronic overeating can contribute to the weakening of your stomach as well. Losing weight can reduce the pressure on your insides and allow your food to be processed without issue. Additionally, foods that are consumed to lose or maintain a healthy weight are lower in fat, sodium, and acid which all help prevent food-induced indigestion. On the other end of the spectrum, maintaining a healthy weight should be done in a healthy manner. Skipping meals, binging and purging, and intentional vomiting can cause or contribute to acid reflux. If none of the natural remedies listed here help, there are medications you can buy over-the-counter that provide immediate intervention and relief. Over-the-counter antacids including Tums, Maalox, Rolaids, and Mylanta help to neutralize stomach acid. Oral suspensions including Pepto Bismol and Carafate treat a wide variety of abdominal disturbances including heartburn/ acid reflux, indigestion, nausea, diarrhea, and ulcers. Other medications that were previously only available by prescription are now available over-the-counter, including Pepcid, Zantac, Prilosec, Prevacid, and Nexium. Before using these medications, you should consult with your physician or pharmacist as they can cause some serious side effects if not used properly. If you have recurrent indigestion and acid reflux, track and monitor your symptoms to uncover your triggers. Identifying and avoiding your triggers can prevent symptoms altogether. However, if your triggers include eating and not eating, or don’t seem to follow a pattern, you may have a bigger issue than you can manage without intervention. At the Southern Reflux Center, our team is focused on finding practical solutions that work. We want to help prevent and treat your symptoms of acid reflux and GERD. If you find yourself using home remedies or suffering from symptoms more than a few times a month and you can not attribute them to something specific, schedule a consultation to discover the root cause.